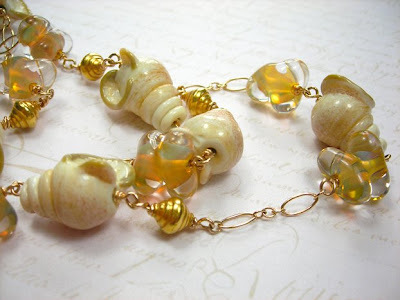 I first saw Laura Sparling's wonderful shell beads about a year ago and yet again fell in love! 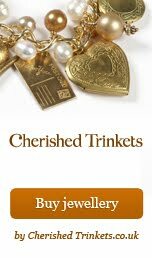 I then waited and waited for some more to come up for sale and vowed that if they did they would be mine!!! And so they were, quite a few months later. Then I got scared, because they are so beautiful I wanted to do them justice. 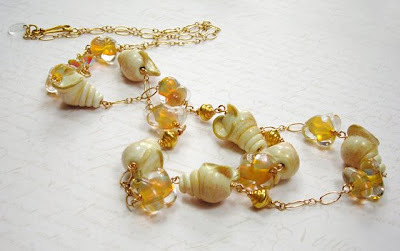 I teamed them with some more of Laura's beads and turned them into this super long necklace. I love the result! I love it too! You're so clever, Janine!